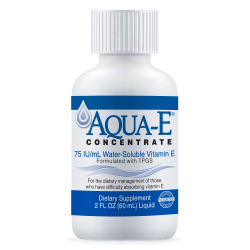 Aqua-E Concentrate is a water-soluble form of vitamin E, providing 75 IU of vitamin E per mL. Uses a clinically tested delivery technology to enhance absorption of fat-soluble vitamins and nutrients. Refrigerate after opening and shake well before each use. Use under the direction of a healthcare professional. Consult your healthcare professional if taking anticoagulant medication. Not suitable as a sole source of nourishment. To obtain product information or to report a serious adverse event, please contact Callion Pharma at 423-930-9243. There is no one answer concerning whether your insurance will cover your Aqua-E Concentrate. It depends upon your insurance and your condition. It may be helpful to ask your healthcare practitioner to submit a Prior Authorization Medical Necessity letter with your insurance carrier explaining why you need to take Aqua-E. Click here to download the Prior Authorization Medical Necessity letter.